Began the season with Triple-A Syracuse...Suffered a hyperextended left elbow on April 10 and did not return to action until July 7...Was recalled by the Nationals on Sept. 4...Appeared in a career-high 21 Major League games...Clubbed his first Major League home run on Sept. 17 at Miami (Richards)...Went 16-for-51 (.314) with three doubles, one triple, three home runs, 10 RBI, two walks, three stolen bases and seven runs scored in 12 Major League starts...Finished the season strong, going 16-for-48 (.333) with seven extra- base hits (3 2B, 3B, 3 HR), 10 RBI and seven runs scored in his last 15 games of the season...In 12 games batting from the leadoff spot, hit .356/.400/.667...Recorderd a career-high four hits on Sept. 26 vs. Miami, going 4-for-5 with a double, home run, a career-high five RBI...Played for Aguilas Cibaeñas of the Dominican Winter League following the season...Hit .265 (26-for-98) with two doubles, one homer, six RBI, 11 walks and 15 runs scored in 25 games. Hit .300 with 37 doubles, eight triples, 10 HR, 47 RBI, 27 SB and 73 runs scored in 114 games... Ranked among Washington Minor Leaguers in average (4th, .300) and stolen bases (2nd, 27)...Was tied for 11th in MiLB with 37 doubles... Had his contract selected on Sept. 7... Made his MLB debut that night vs. PHI... Tallied first MLB hit on Sept. 10 vs. PHI...Went 5-for-18 (.278) with a double, two triples, four RBI in five Major League starts....Hit .244 (10-for-41) with three homers in 13 games for Mesa of the Arizona Fall League. Hit .280 with 17 doubles, eight triples, nine home runs, 42 RBI, 32 walks, 37 stolen bases and 75 runs scored in 100 games...His 37 stolen bases ranked third among Nationals farmhands...Following the season, was cited by Baseball America as the No. 3 prospect in the Carolina League. Led Washington's Minor League system in hitting (.352) while ranking fifth in stolen bases (24)...Posted a .445 OBP and a .507 SLG. Ranked 10th in the Dominican Summer League with a .484 slugging percentage. November 26, 2018 Aguilas Cibaenas placed OF Victor Robles on the reserve list. 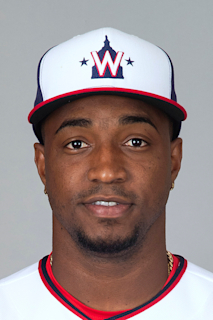 October 15, 2018 OF Victor Robles assigned to Aguilas Cibaenas. September 4, 2018 Washington Nationals recalled CF Victor Robles from Syracuse Chiefs. July 27, 2018 Syracuse Chiefs activated CF Victor Robles from the 7-day disabled list. July 20, 2018 Syracuse Chiefs sent CF Victor Robles on a rehab assignment to Auburn Doubledays. July 7, 2018 Syracuse Chiefs sent OF Victor Robles on a rehab assignment to GCL Nationals. April 13, 2018 Syracuse Chiefs placed CF Victor Robles on the 7-day disabled list retroactive to April 10, 2018. March 20, 2018 Washington Nationals optioned CF Victor Robles to Syracuse Chiefs. October 23, 2017 OF Victor Robles assigned to Mesa Solar Sox. September 7, 2017 Washington Nationals selected the contract of Victor Robles from Harrisburg Senators. July 24, 2017 CF Victor Robles assigned to Harrisburg Senators from Potomac Nationals. July 12, 2017 Potomac Nationals activated CF Victor Robles from the temporarily inactive list. July 7, 2017 Potomac Nationals placed CF Victor Robles on the temporarily inactive list. May 1, 2017 Potomac Nationals activated CF Victor Robles from the 7-day disabled list. April 20, 2017 Potomac Nationals placed CF Victor Robles on the 7-day disabled list retroactive to April 19, 2017. March 1, 2017 CF Victor Robles assigned to Washington Nationals. August 12, 2016 CF Victor Robles assigned to Potomac Nationals from GCL Nationals. August 6, 2016 OF Victor Robles assigned to GCL Nationals from Potomac Nationals. July 25, 2016 Potomac Nationals placed OF Victor Robles on the 7-day disabled list. June 27, 2016 OF Victor Robles assigned to Potomac Nationals from Hagerstown Suns. April 6, 2016 OF Victor Robles assigned to Hagerstown Suns from Auburn Doubledays. July 19, 2015 OF Victor Robles assigned to Auburn Doubledays from GCL Nationals. June 21, 2015 OF Victor Robles assigned to GCL Nationals. March 10, 2014 CF Victor Robles assigned to DSL Nationals. July 2, 2013 Washington Nationals signed OF Victor Robles.